WEST RUTLAND — The town is poised to buy another chunk of the marsh. Town Manager Mary Ann Goulette said the 55-acre parcel would unite two other municipal properties, giving the town a unified, 357.9-acre conservation area. The Select Board approved the purchase at its regular meeting Monday. The town manages the conservation area in partnership with the Vermont Audubon Society. Duck Stamps: $25 in July 2010? Waterfowl habitat conservation is moving closer to keeping pace with the skyrocketing land values of the past several years today, as the House Natural Resources Committee passed the Migratory Bird Habitat Investment and Enhancement Act, sending the bill to the House floor. Since being set at its current price of $15 in 1991, the purchasing power of the stamp has severely hampered the U.S. Fish & Wildlife Service’s ability to purchase land with the funds raised by stamp. Under the new bill, the price of the stamp would be raised to $25 after July 2010. More than 1.5 million people purchase duck stamps each year, and over 95% of them are waterfowlers. Stamp collectors as well as other bird and wildlife enthusiasts also purchase the stamps, either for their own collections or for the free access to National Wildlife Refuges that the stamp allows. Can 'no-kill' shelters for feral cats help wild birds? The "10th Life" Sanctuary is a seven-year-old "no-kill" 501(c)(3) not-for-profit charity dedicated to providing lifetime care to sick, unwanted, and feral cats. At the present time we are providing lifetime care for over 600 cats. We help people and cats. We also help other animal shelters and rescue groups become "no-kill" by taking their perfectly lovable - but unadopted - cats. Are no-kill shelters and sanctuaries a better option for feral cats than Trap-Neuter-Release programs? 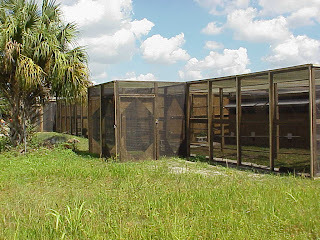 Sanctuaries built like this -- with enclosed habitats -- prevent the cats from preying on wild birds and other native species. Should birders donate to and promote no-kill shelters that accept feral cats? The release on Wednesday of U.S. Fish & Wildlife Service's addendum to the 2006 national survey -- "Birding in the United States: A Demographic and Economic Analysis" -- created a buzz among online birders, naturally. The new report also put America's 48 million birders and their economic contributions -- $36 billion in 2006 -- in the mainstream media's spotlight. Asheville Citizen-Times, N.C.: "Report: birdwatchers contribute $36 billion to U.S. economy"
Duluth News Tribune: "Minnesotans go bird crazy"
Los Angeles Times: "Bird-watching participation boosts U.S. economy according to report"
Memphis Commercial Appeal: "Billions for birdwatching: One out of five in U.S. are, even more in Tennessee"
San Jose Mercury News, Calif.: "Birdwatchers no featherweights when it comes to contributing to economy"
United Press International: "One In 5 U.S, Citizens Is A Birdwatcher"
Will birders capitalize on the demographic and economic data as well as the recent news coverage? Will they share the data with local, state and national politicans to increase their financial and political presence? If birders don't, do we lose the right to whine about other groups' larger presence (such as hunters)? Oregon Zoo's condor breeding program recently took four California Condors to The Peregrine Fund's World Center for Birds of Prey in Boise, Idaho. The three females -- Yak'Mo (#496), Ewauna (#481) and Kalak-ala (#487) -- and one male (Atfa'lai'i, #479) were hatched and raised at the zoo and will be released into different regions. Ewauna and Kalak-ala will be released along the California coast; Yak'Mo in Arizona; and Atfa'lat'i in Baja California, Mexico. 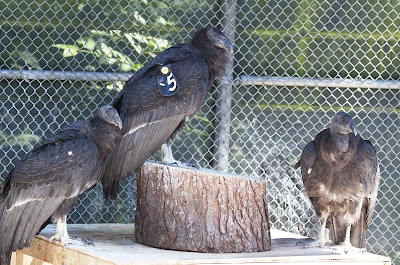 Zoo staff returned from Boise with five condors that will live in the zoo's Johnsson Center for Wildlife Conservation, and two -- male Alishaw (#90) and male Maluk (#55) -- will participate in the breeding program. Three will live in a large pre-release pen until they can be released into the wild. Three of the new residents include male No. 461 (left), male No. 465 and female No. 464. In a press release, condor curator Shawn St. Michael said, "Given the very social nature of condors and the slow maturation of juveniles, it's important to keep the youngsters with a mentor so they learn proper behavior. If left to their own devices, as is common for human teenagers, they will get into all sorts of trouble." The recent completion of the Willamette Valley birding trail adds a fifth element to the Oregon Birding Trail system. This trail includes 12 loops -- Columbia, Portland, Tualatin, Heritage, Yamhill, Willamette, Luckiamute, Alsea Falls, Santiam, Fern Ridge, McKenzie and Big River -- and details about each loops is available as a separate PDF. A species checklist notes more than 420 species observed in the valley and shows the most likely area to see each species; for instance, "a" means agricultural fields/pastures, and "b" means brushland/brushy edges. 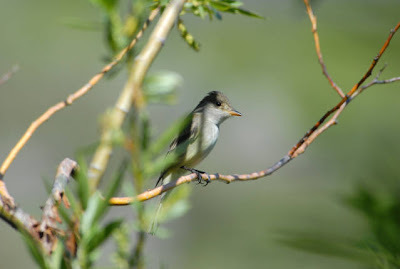 A recent article in The South County Spotlight highlights birds seen on the Columbia loop, such as Willow Flycatcher (below). A new report from U.S. Fish & Wildlife Service says one in five Americans watches birds, putting the number of birdwatchers at 48 million. The most recent economic data shows that birders contributed $36 billion to the U.S. economy. "Birding in the United States: A Demographic and Economic Analysis," a 20-page addendum to the 2006 national survey of fishing, hunting and wildlife-watching recreation, clarifies that the national survey considers a birder to be an individual that has "taken a trip 1 mile or more from home for the primary purpose of observing birds and/or closely observed or tried to identify birds around the home." That excludes, for instance, someone who notices a gull in a store's parking lot and calls it a "seagull." What do you think of that definition? USFWS calls it a conservative definition. I wager that some birders consider it too broad. The N.C. Arboretum, already a top destination for birding, recently officially joined the N.C. Birding Trail as the statewide guide program continued to expand. In conjunction with the Arboretum's celebration as an official part of the N.C. Birding Trail Guide is the current exhibit, “H. Douglas Pratt and John C. Sill's ‘Birds: The Science of Illustration,” in the Baker Exhibit Center through Nov. 1. In addition to the illustrations, the exhibit includes a bird nest collection, an interactive bird song display, an interactive habitat mural and an “illustration table” with sketch paper, pencils, erasers and colored pencils. 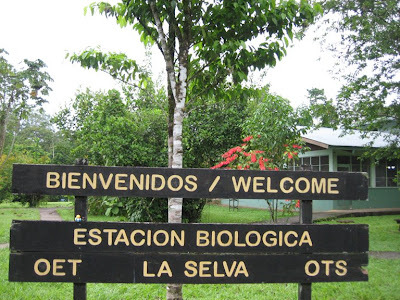 Thursday morning, we retraced our route to La Selva Biological Station and met up with the station's head naturalist guide, Rodolfo Alvarado (Voice 1). Connie, Al and I benefitted a lot from Rodolfo's expertise as well as that of Alex and Clay (below), who helped us I.D. many species. Our group briefly walked the same concrete path and encountered another trogon -- a Slaty-tailed -- before stopping to watch a poison dart frog as it called repeatedly. The red amphibian puffed up immensely before each call. (Did you know a group of frogs is called an army?) Then we got to feast our eyes on a Violet-crowned Woodnymph -- such a delicious hummingbird -- before crossing the river via Stone Bridge, named for Dr. Donald E. Stone. 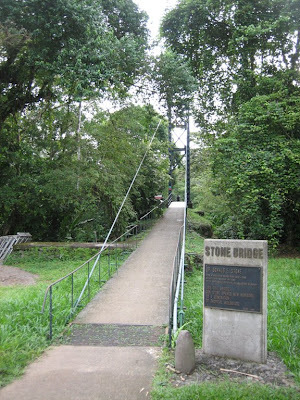 The suspension bridge provided neat looks up and down the river, where crocodiles roam. On the other side of the river, Rodolfo used a green laser pen to point toward four lesser sac-winged bats roosting on a tree -- pretty cool. Along the paved path, a firebush attracted White-necked Jacobin and Blue-chested Hummingbird. Wow! Rodolfo also showed me the hummingbird flower mites within a firebush flower. When a hummer feeds on the nectar inside a flower, the mites hitch a ride on the bird's bill to get to another flower and a new supply of nectar. 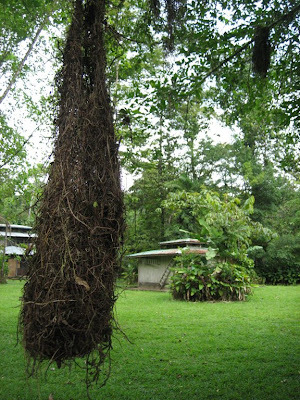 Then we encountered more of the pendulous woven nests (below) created by Montezuma Oropendolas, the incredible birds spied with Alex Martinez on Wednesday morning. Moving into the forest, we followed a paved path and spied a huge white moth flat against a tree, quickly followed by a bullet ant -- the biggest ant I've ever seen with reportedly the most painful sting ever. Continuing down the path, we heard Bay Wrens making a ruckus. The object of their loud scolding? A beautiful, yellow and black kingsnake. Deeper into the forest, we enjoyed looks at Black-capped Pygmy-Tyrant (very pygmy!) 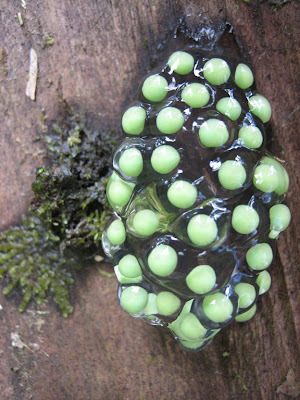 and Ochre-bellied Flycatcher before seeing these tree frog eggs on the boardwalk. I was fascinated by the gelatinous glob. Then we walked into an area that yielded wonderful delights: Rufous Motmot (the species on the cover of WildBird's March/April issue! 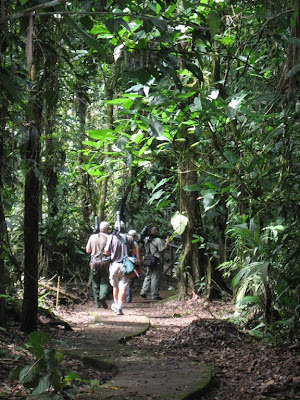 ), Chestnut-mandibled Toucan, White-collared Manakin, Broad-billed Motmot and howler monkeys!